Sergio Espinoza addresses the audience at an honors assembly for Willow Run graduating seniors. 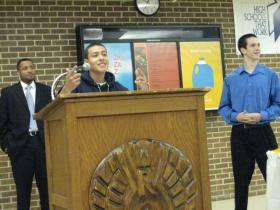 Both Espinoza, middle, and Matt Reno, right, earned awards. Assistant Principal Shannon Smith, left, handed out the awards. May. 29, 2009 · 5:21 a.m. The only activity at Willow Run High School at 6:30 p.m. Thursday night was an honors assembly in the cafeteria. Students were honored for academic, athletic and extracurricular achievements. The district’s board of education did not hold the closed session meeting it had scheduled last week. The meeting was discussed at last week’s regular board meeting. It came after the district’s superintendent, Doris Hope-Jackson, submitted a letter of resignation to the board only to withdraw it a day later. Jackson, who was on vacation, was not at the meeting. Before the honors assembly, Jackson said there had been some dialogue about a meeting, but nothing had been scheduled. She said no meeting had been posted. Andy Blakita, a trustee on the board, talked briefly with the Citizen before the honor’s assembly began. He said the meeting was not held due to the legality of holding a closed meeting to discuss Jackson’s performance without her present. Holding a meeting in closed session would allow the board to meet without the public present. According to the Michigan Open Meetings Act, a public body can hold a meeting in closed session to discuss personnel evaluations only if the employee in question requests the meeting to be closed to the public. The employee may rescind that request at any time. “There’s no possible way I would be a part of (the meeting) without Dr. Jackson’s presence,” Blakita said Thursday night. He said other board members are still looking at a way to discuss the matter that permissible under the state act. Blakita lost his seat in this month’s election to Willow Run parents Joi Jenson and Anglesia Brown. Board President Claudette Braxton did not run in the election. Braxton and Blakita will serve their last month on the board in June. “We’ll see how this all comes out,” Blakita said. Jackson said she is still considering her employment with the school district before Thursday’s assembly. The board has a regular meeting scheduled for Thursday.